Hey Hun, Thank you for the cake. It went down really well with everyone, they loved it. Hi Aimee, Just wanted to say thank you for the cupcakes. I have heard they taste amazing and her brother ate half of them before Kirsty got home!! Haha. Hi Aimee, Thank you so much for your help. I took them to the wards and the staff were absolutely delighted with them. If I ever need anything similar I will have no hesitation in contacting you. Can I thank you from the bottom of my heart. We loved your cake. You were very generous with your ingredients. i will definitely be using your expert service again. 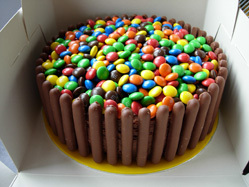 Hi Aimee Just wanted to say thank you for such a gorgeous cake! It looked stunning and tasted absolutely delicious. There were loads of comments about how unbelievably good a GF and DF cake is!!! A massive thank you to you. I am 110% impressed with the quality, appearance and service that you provided. Hi Aimee The cake was very nice, thank you so much! Aimee Just wanted to say thank you for the lovely cakes, everybody enjoyed them. Thank you Aimee you have done a grand job yet again. Seriously they look so amazing and I cannot wait to show these cupcakes and the basket off. Thank you so much for getting back to me. I have firstly to say that we were soooo happy with the cupcakes we had for our wedding, so a thank you so much! Joe loved the big victoria sponge cupcake so much he keeps talking about it and I would like to order another one! Thank you Aimee. Everybody loved the cupcakes. Aimee. My mum just found her 5 year old grandson with one of your cakes. He liked them so much he had sqirreled one away for after school today. Hello. Thank you very much Aimee. He loved the cupcakes. Hi Aimee, the cakes were fantastic and everyone was raving about them. They looked perfect in the room as well. Hi Aimee, Just wanted to say a big thank you for supplying us with our wedding cake. Our guests loved the cupcakes and we managed to come home with a few ourself and also our top tier. You did a great job! Thank you so much again you provided us with a great service. Speak to you soon. Hi, Thank you for the cupcakes. They were lovely. Everyone enjoyed them. Thank you Aimee. Thank you so much, he loves them x.
Hi, I gave my mum 6 dairy free vanilla cupcakes for Mothers Day and she said they were lovely. So nice she wasn't very keen on sharing them. We will be back. Also thank you for your efficient service. 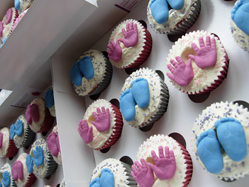 Hi Aimee, Wanted to say thank you for the kind assistance and great service provided by your team with the cupcakes. Cheers and enjoy the rest of your week. I would like 6 After Eight flavour cupcakes with a 10 on and 6 classic chocolate. My friend has a gluten intolerance so I ordered cupcakes from you for us both on my 40th a couple of years ago. I still remember how delicious they were. Aimee, Thanks for the cupcakes, they were lovely and my friend loved them!!! Hi Aimee, My friend got me the afternoon tea to share with her as I'm dairy intolerant. It was so nice to be able to eat a variety of cakes as I have never been able to do this before, it was really exciting. Thanks for offering this option. they were all yummy. Hi Aimee, The cakes were amazing!!!! We all loved them. My daughter was especially pleased and will be mentioning you in her blog. They really were delicious. Thank you again. Hi, Thankyou so much for my cupcakes and festive spice cake it was gorgeous definately gonna buy more next time. Hi, Thanks for the cakes they look lovely can't wait to tuck in to them tomo! Hello, I'd like to thank you very much for the cupcakes. They're extremely tasty. So thanks so much for making and delivering them to my door. Hi Aimee, The cup cakes went down a treat! Could not tell they were gluten free. Thanks again. Hi, Thank you for my niece's gluten free cupcakes. They were beautiful. Hi Aimee, I would like to say a huge thank you for the truly amazing cakes that were delivered to my place of work on Friday as a birthday gift. I enjoyed them so much I would like to order some more. I am still coming to terms with my food allergies as I am finding there is so much I cannot eat and a lot of the free from foods I find so flavourless but you have restored my faith with how good the cakes taste!!!! Thank you for the delicious cupcakes. My valentine loved them very much. I am very happy with the friendly service and hope to order more in the future. The cupcakes were so pretty!! I just spoke to my Mom and she was blown away. Thanks so much! Just to say thanks for my daughter's lovely birthday cake, it tasted very yummy. People couldn't believe it was gluten free and dairy free. Thanks again. Thank you so much for the cupcakes for our wedding. Everyone commented on how amazing they were! I was just wondering if I could order some more for Valentines day and how much they would be? Thanks for the red rose cupcakes, my girlfriend loved them. Hope all is well. Just wanted to say that the cupcakes you made for my 21st (25th October) were amazing in taste and presentation. I've had so many compliments for them and just wanted to say a massive thankyou. Will be sure to contact you again for more cakes! Thanks again. Thank you so much for the gorgeous cakes that I purchased for my sister-in-law who is coeliac.She was delighted with them. She said she had never had gluten free cake that was so moist and had so much flavour. As a none coeliac I have always felt sorry that she cant have the same cakes and bread that we have but everyone who tried your gluten free cupcakes said they were the best cakes they had ever had!!! Once again thank you and we will certainly recommend you and use you again. Thank you Aimee for my girlfriend's cupcakes, they were lovely. Thankyou very much. My friend loves them. Thanks so much Aimee! They are fantastic :) I will recommend you to my friends. Just wanted to send a BIG thanks for the cupcakes you delivered and nicely arranged for us last Friday. They went down a treat and people started eating them before the buffet..!!! A big success. Having been meaning to text and say thank you for the lovely cupcakes you delivered to my daughter for Valentines. She said they were lovely. Crestwood cupcakes are totally amazing! I am a cupcake connoisseur, and these are by far and away the best I have had! They look beautiful and taste even better, and I dare anyone to settle for just one! Also they arrive in the prettiest packaging and travel very well! Many thanks, I will definitely be back for more! Just wanted you to know that I have a very happy girlfriend thanks to your cupcakes so Thank You. I'm told they're delicious as well. Thanks again for being so helpful! My husband has told me the cakes are beautiful! I will pass on my recommendation of your lovely work. Many thanks Aimee for all your help with Lucy�s birthday cupcakes she rang me earlier to say how wonderful they were and said they taste delicious. Just wish you lived nearer !!!! Thank you so much for the cupcakes. He loved them. I just wanted to drop you a note to say thank you again. We had a very successful day for Macmillan and your cupcakes went down a storm. We have still got a few leaflets and cards, but most were picked up on the day, so fingers crossed you get some business off the back of this. I will be in touch if we hold any further events that you might be interested in. My daughter gave me some of your great cakes and I wanted to say how delicious they were. They look great, tasted better. I was recently given some Crestwood Cakes and Bakes cupcakes for my birthday, which was a lovely surprise. 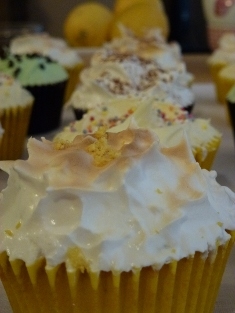 Each of the varieties (Lemon Meringue, After Eight and Lemon sponge with Vanilla icing) were delicious and incredibly more�ish. I will certainly be back soon for some more, especially the lemon with vanilla which were lovely and moist and extremely tasty. Thanks ever so much for my recent order of cupcakes. The �after eight� cupcakes were so minty and tasty and the lemon sponge ones where very tangy. 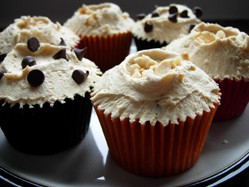 I�ve never had such flavoursome cupcakes before. 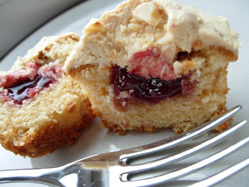 Others look nice but don�t taste of much at all, but yours looked and tasted amazing. Will definitely be back for more in the future, where I can�t wait to try some of the other flavours. Hi Aimee, the wedding cupcakes you made for us were absolutely amazing. There are a few guests who didn't end up tasting one though because some of the people who got to the cakes first liked them so much that they took several each!! The amaretto icing was divine, and the cakes themselves were so generously sized and looked so pretty. Thank you again so much for a wonderful cake that we will always remember. I wanted to write to thank you for the wonderful decorative cakes you supplied us with for our 2 office birthday celebration parties. The vanilla and chocolate cupcakes were delicious and I thought those could not be beaten until I tasted the After 8 cakes you made. We were so impressed with the care you had taken to not only make us yummy cakes but the presentation of them, they were very pretty and professional. We were the talk of the building so once again we would like to thank you and look forward to ordering from you again to try some of your other creations. 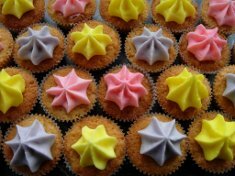 Crestwood Cakes and Bakes supplied cup cakes for my �Christmas girls� night gathering� in 2010. After careful consultation as to flavours, colour schemes and themes, the delicately flavoured vanilla cakes were immaculately presented in silver cases with silver baubles. They made a dramatic centre piece for the table when placed on a cake stand. The taste was equally impressive! I would strongly recommend Crestwood Cakes and Bakes for any occasion. Hi Aimee, Thanks so much for making the lovely cupcakes for my 30th birthday. They really helped to add something to the party. They were all so gorgeous, moist and yummy. My absolute favourites though were the carrot cakes - just heaven! Dear Aimee, Thank you for the cupcakes. The lemon meringue cupcakes were very tasty and very unique. 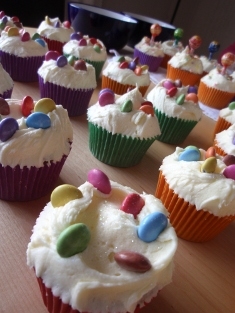 Thank you for the Dolly Mixture cakes you made for my daughter's 6th birthday party. They added colour and excitement to the party. I looked everywhere to find her some dairy free cakes that were fun. We will certainly be back. Thank you Crestwood Cakes and Bakes for the selection of cakes you put together for me. There was something for everyone. Hi Aimee - cupcakes were well received thanks. There was one left over so I had to eat it!